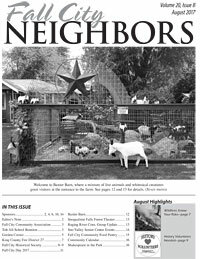 Fall City Neighbors is a monthly community non-profit newsletter published since 1998 and supported by sponsorships and donations from the community. The goal of the newsletter is to foster a caring and connected community of neighbors throughout the Fall City area. You can also scroll to the bottom of this web page for the past 12 months of newsletters. We encourage submissions, story suggestions, and comments from our community. We are always looking for writers, reporters, artists, and idea people interested in volunteering for this publication. Deadline for submission is the 10th of the month. Click here for writers guidelines. *Free classified ads for non-profits and individuals only, no business ads except for local help-wanted ads. Click here for guidelines on what to include in a business profile. Donations: Individuals or groups are invited to send in donations to help with Newsletter costs. Sponsorships: Sponsors are the life blood of the newsletter! And many others for ideas and encouragement. Writers, reporters, artists, and idea people! Consider lending your talents to this local publication.